October 17, 2011 - The Australian and International Pilots Association launch a new website, qantasshareholders.com, to provide information to disgruntled Qantas shareholders on how to make their voice heard at the Qantas Annual General Meeting (AGM) on October 28. Since launching the popular campaign site, AIPA has been inundated with inquiries from Qantas shareholders wanting to know how they, as shareholders, can send a message of disapproval to management over plans to shift Australian Qantas operations to Southeast Asia. 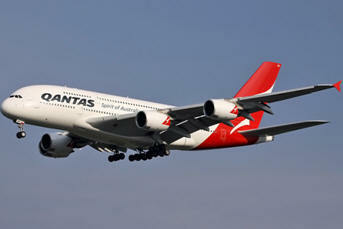 Qantas Airways is the flag carrier of Australia. It is Australia's largest airline, the oldest continuously operated airline in the world and the second oldest in the world overall. Qantas headquarters are located in the Qantas Centre in the Mascot suburb of the City of Botany Bay, Sydney, New South Wales. AIPA Vice President Captain Richard Woodward said qantasshareholders.com was aimed at assisting Qantas shareholders to send a message to management that their current strategy is poison for the iconic airline. ?AIPA has been hammered with calls and emails from Qantas shareholders, many of whom are loyal frequent flyers, as to how they can vote at the AGM to send a message to Alan Joyce and his management team,? Captain Woodward said. ?That?s why we are making this website public. It provides information on how shareholders can sign a proxy and vote against key motions in an effort to make management listen. For example, shareholders will be able to vote on Mr Joyce?s new $5 million annual package at the AGM. I would hazard a guess that this sort of largesse, being splashed on a CEO whose strategy has seen the share price tumble, would not be too popular. New revelations published about the astronomic salaries paid to Qantas executives, including CEO Alan Joyce, have fuelled further anger from the public today, who are sick of seeing one of the last true iconic Australian companies mismanaged. Eight most senior executives getting a pay rise of 62 per cent from $8.9 million last year to $14.4 million this year. Qantas?s annual report released shows Qantas CEO Alan Joyce salary went from $2.9 million to $5 million at a time the company plans to layoff over 1,000 employees. AIPA Vice President Richard Woodward, a Qantas captain, said the huge salaries and bonuses being lavished on executives and the board were completely out of step with the airline?s performance. See (Layoffs At Qantas Airways While Executives Receive Considerably High Pay Raises). ?Most Qantas pilots are shareholders too. This is a way that they can make their voice heard. To date, the only forms of industrial action pilots have taken is in-flight announcements promoting our website and ties with a ?Qantas flight, Qantas pilot? message. Shareholders own Qantas, not Mr Joyce and his outrageously overpaid team. There is a real mood out there to prove that at the AGM and we want to help in any way we can. ?Mr Joyce is determined to make Qantas workers the fall guys for the airline?s current woes. Well, we?re not playing into that. Shareholders will ultimately decide the direction of the company and we are confident that in the end they will show they don?t like Mr Joyce?s plan to offshore Qantas any more than we do. ?The two key assets of the Qantas brand are its unique Australian identity and its unparalleled safety record, built by pilots and staff. Both are under threat due to Mr Joyce?s strategy. To lose either would be catastrophic for pilots, passengers and shareholders. ?